Sorry for my bad english, my friends, in this article i will try to aware you from buying fake copies of PU scope for MOSIN/SVT rifle. At least, when you buy a copy - you have to know, that it is not original historical item, made in USSR. First of all, i want to describe difference between copy and original PU scope, also i want to help you identify, do you have original or fake PU scope, and also i want to help you to buy original historical PU scope to your MOSIN/SVT rifle (for example, from us). Most of PU scopes selling at ebay are copies, made in modern times, i will try to describe you most of them. Bent handle shutter was never produced in Russia and USSR. In USSR handle was produced only molded together with the body of the shutter. Tap and drill was also never produced and was never present in scope set. On the face of mount there is an imitation of milling while original mount have flat surface. At this picture you see original scope attached to fake copy of mount, molded from soft metal while original mount was milled from hardened steel. As #2, also made in Cherkasy, Ukraine FOTOPRIBOR plant right now. This modern copies of PU scopes are made in Izyum-Holding, Izyum optic mechanical plant. Numbers of scopes beginning in "Ч" was never produced (look at our table of original scopes at bottom). Same as #2, #5. At this picture you can see wrong (uneven, rough) star mark. Original scopes have clear smooth edges. Also, as #2,#5,#7, this non-original modern copy of PU scope made in Cherkasy, Ukraine. Mark painted in very bright white paint (1), leather caps made recently, very fresh skin (2), color of bracket differs from color of scope body because it is made from soft metal (3), original mounts was never equipped with drill and taps for installing scope at field, because all sniper rifles was selected from best rifles at plant (factory) and scope was installed at plant (factory). There was no need to equip drill and taps in scope set (4). Here is also cope of PU scope made in Cherkasy plant, same as #2,#5,#7,#8. At this picture you see clear smooth outflow (1) and also different color of metal at body and mount (2). I hope, now you more understand fow to recognize fake or copy of PU Mosin and SVT-40 scopes. Here is a full table of ORIGINAL PU MOSIN NAGANT AND SVT-40 scopes. Don't be ashamed buying a fake ora copy of scope for you historical original russian soviet rifle. P.S. 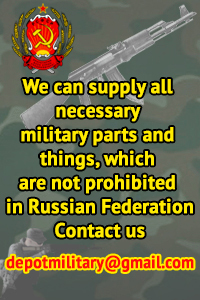 We sell ONLY original items, our PU scopes are original, made in USSR. Here is a full list of ORIGINAL USSR PU MOSIN and SVT-40 scopes for you rifles. Click here and look at them.